The primary challenge of machine perception is to define efficient computational methods to derive high-level knowledge from low-level sensor observation data. 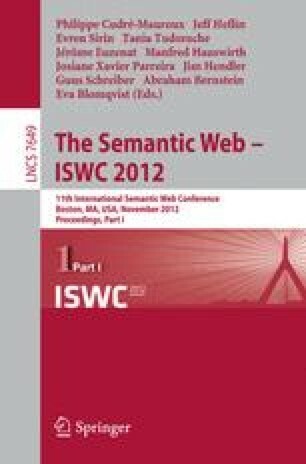 Emerging solutions are using ontologies for expressive representation of concepts in the domain of sensing and perception, which enable advanced integration and interpretation of heterogeneous sensor data. The computational complexity of OWL, however, seriously limits its applicability and use within resource-constrained environments, such as mobile devices. To overcome this issue, we employ OWL to formally define the inference tasks needed for machine perception – explanation and discrimination – and then provide efficient algorithms for these tasks, using bit-vector encodings and operations. The applicability of our approach to machine perception is evaluated on a smart-phone mobile device, demonstrating dramatic improvements in both efficiency and scale.